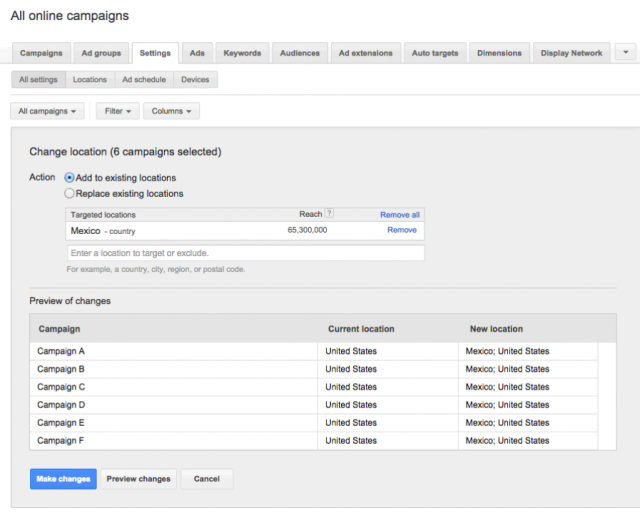 Google quietly announced a new tool to bulk update your ads within the AdWords interface. The new tool lets you quickly update your settings across campaigns within your accounts, specifically location changes, language changes, campaign end dates, and ad rotation changes. Adjust other settings like language, campaign end dates, and ad rotation. Click the Campaigns tab at the top. Check the box next to any campaigns that you want to change. From the Edit menu, select the attribute that you want to change. In the box that appears, specify your changes. Optional: We recommend you click Preview changes to see how your campaign’s settings will change. Previous story: Bing Malware Notifications Correct?